From the 2016 Celebrating Excellence | With at least two attention-driven mass shootings in the last year, it has never been more important to accurately understand the minds of killers—especially those who kill for fame. 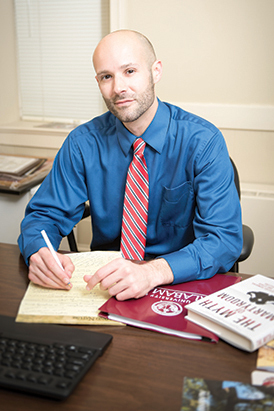 Dr. Adam Lankford, an associate professor in the Department of Criminal Justice, has been studying fame-seeking mass shooters since the aftermath of 9/11. In the past year, his research on the subject has been cited by The New York Times, The Washington Post, and The Los Angeles Times, along with many other national and international media outlets. “I was studying things like suicide terrorists,” Lankford said, “when I began to see psychological and behavioral similarities between suicide terrorists and some of these mass shooters. Not all, but a lot of suicide terrorists also want to be famous. Wanting to know more about these fame-seeking mass shooters—how many there are and the similarities between them—Lankford decided to start a catalog of all the shooters who had explicitly sought fame. Consequently, Lankford limited his definition of fame-seeking mass shooters to those who explicitly said—verbally or in writing—that they were seeking the public’s attention. There may be others who were not so open about their intentions, but rather than speculating, Lankford wanted the study to be as accurate as possible. In all, he found 24. But those 24 stand out in more ways than their explicit fame-seeking. According to Lankford’s study, they also tend to be younger. While the average mass shooter is 34.5 years old, the average fame-seeking mass shooter is only 20.4. What’s more, these young, fame-seeking shooters are also likely to kill more people. When comparing them with other mass shooters, Lankford found that fame-seekers kill an additional 4.2 victims on average. Unfortunately, more victims usually means more publicity—driving these shooters to kill in increasingly unprecedented numbers. Most disconcerting of all, however, is that these fame-driven crimes are on the rise. In the ‘60s there was only one—and the same is true of the ‘70s. In the ‘80s there weren’t any, but in the ‘90s the number jumped to six, and since 2000 there have been 15. “The United States has approximately 31 percent of the world’s offenders,” Lankford wrote in an article that was published in Aggression and Violent Behavior earlier this year. A striking 75 percent of the offenders who explicitly seek fame are from the United States. Only six of the 24 were from other countries. However, he added, the culture does create a context in which these events are more likely to occur. In the article, Lankford predicts three outcomes if the culture of the United States does not change: First, the number of fame-seeking shooters will continue to grow. Second, these shooters will attempt to kill more victims in order to distinguish themselves from previous offenders. Third, these shooters will find unprecedented places and methods of killing in order to generate more attention. He also suggests that, with the global spread of American media and entertainment, fame may become increasingly sought-after in other cultures—potentially leading to a greater number of these types of shootings worldwide. While the debate about how to deter mass shooting largely revolves around gun control, bullying, mental health, and responsible media coverage in the aftermath of shootings, Lankford adds his own thoughts about resolutions to the mix. Lankford advises people to remember that fame is not a magical elixir of happiness. In fact, pointing to various psychological research, Lankford said, “If your goals are things like fame or image or money, which are considered extrinsic goals, you are much more likely to suffer from things like anxiety, narcissism, and depression.